DeWALT DCB182-XJ 18V XR 4.0Ah Li-Ion Battery Pack The DeWALT 18V battery that now provides you with 33% more runtime compared to previous generations of batteries. It does this while still weighing the same as the 3.0 Ah model. 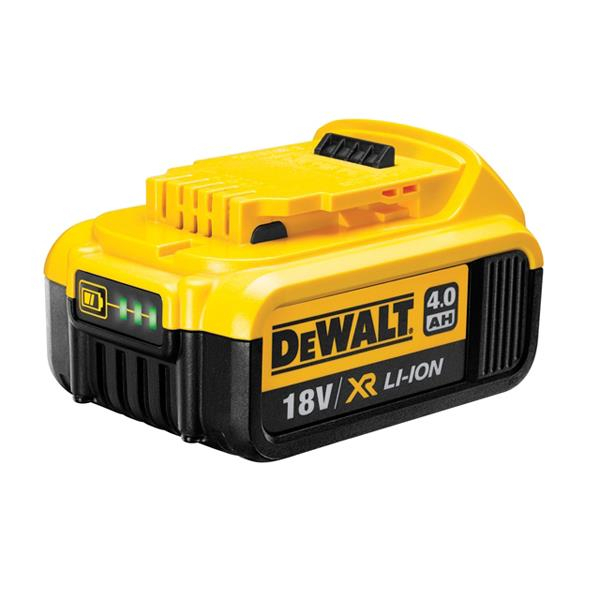 The battery has excellent electrical characteristics, thanks to technical innovation designed and engineered by DeWALT. It is lightweight in design, making it ideal for use on cordless tools, as working with heavy tools for prolonged periods of time is very fatiguing. This battery pack weighs the same as a 12V NiCd/NiMH pack, while offering 18V. ◦Weight: 0.64kg Because of its compatibility with other DeWALT products, this battery is a great addition to any DeWALT user’s tool box and is part of the reason why this it has become so popular.